NYC, 02/11/2019, 1:00PM. 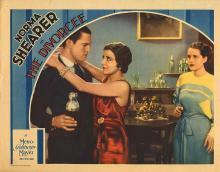 The Divorcee (1930): Oscar winning romance starring Norma Shearer. 84 min. Director: Robert Z. Leonard. Starring Norma Shearer, Robert Montgomery, Chester Morris. Robert Z. Leonard was nominated for the Academy Award for Best Director. The film was also nominated for Best Picture and won Best Actress for its star Norma Shearer. The movie is based on the novel Ex-Wife by Ursula Parrott.